his team for putting on a great Show in a new venue. Well done again to Hannes for winning Grand Champion. 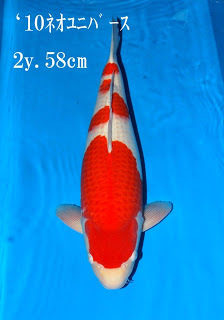 This year with a stunning Dream Koi Sakai Sanke- the quality of this koi is extremely high and has a fantastic future. He also won Supreme size 7 with a striking Momotaro Kohaku. 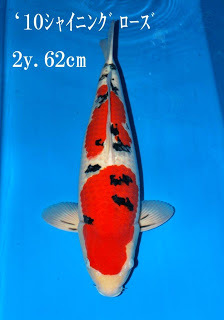 And Jumbo B with an 80cm Ogata Ogon. 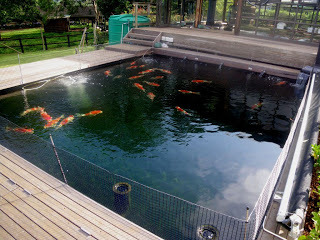 A video of 3 Ogata Ogons bought by Dream Koi as nisai and grown on in our new pond. Hannes’s ogon – the bigger of these 3 -grew from 55cm to 80cm in just under 2 years. Junior Champion went to Pieter Odendaal who bought a Sakai Sanke as a 26cm tosai from Dream Koi and grew it on- always a special accomplishment! 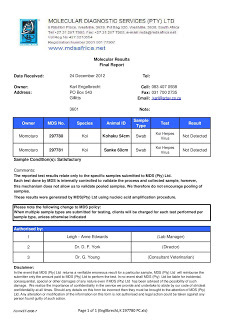 Well done to Drikus van Dyk for winning Grand Champion and Mature Champion at the Southern Cape Show. 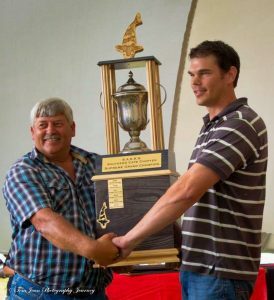 Drikus collecting his Grand Champion trophy. Very well earned! Drikus has done a great job to bring on this Dream Koi supplied Sakai Big Rose Sanke so well- the body in particular is magnificent! He won Supreme size 8 with this Sanke in 2012 and now Grand! 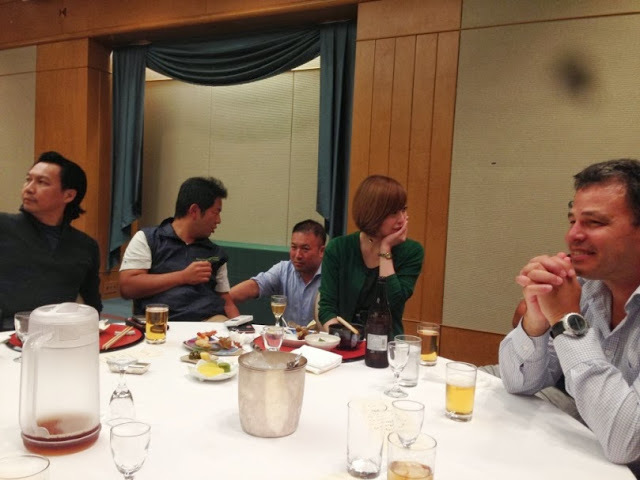 A “dissapointed” bidder – Ryuki sees the funny side! 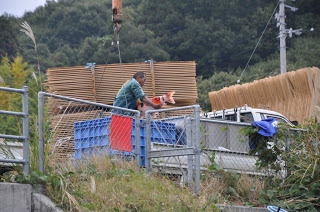 Takaharu -Beppu Fish Farm- an ex employee good friend of Kentaro. Dream Koi will be back in Japan to buy a lot more stock between to 2nd and 9th of November.Watch the blog for updates and pictures of our travels. 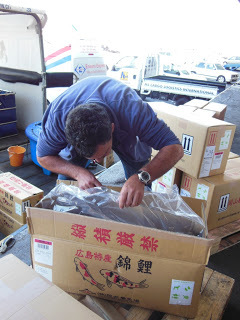 It was just before my 2011 November trip to Japan that Mark Colyn got hold of me and asked me to select two special gosanke Koi from Sakai Fish Farm in Hiroshima. 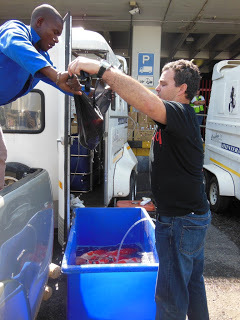 Of course he wanted these Koi to be able to compete at our Koi shows in South Africa. 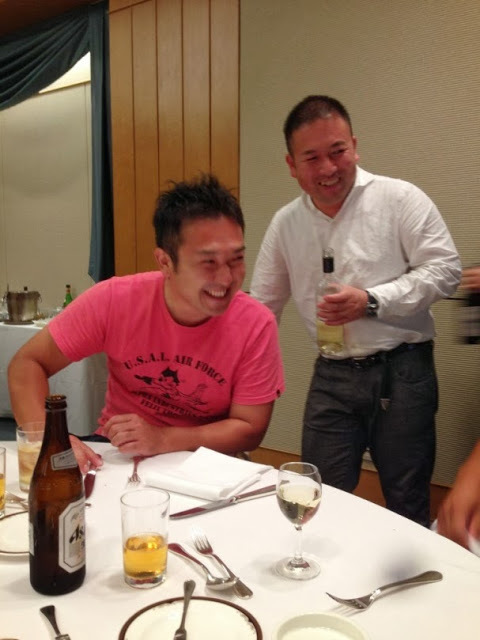 Sensibly Mark was not prepared to spend the amount of money it would take to buy an All Japan winner. The process of looking for a “show winning “Koi is not straight forward. 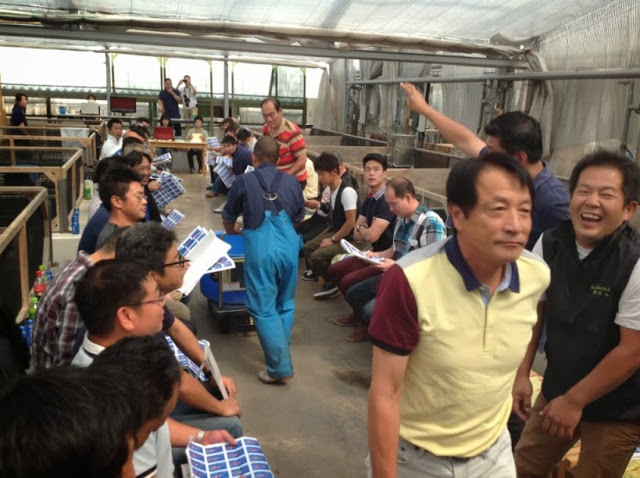 One has to firstly have a very good relationship with the breeder to be introduced to such Koi and also to trust his judgement regarding how the judges will view these fish – not just on the day, but in the future when it develops. Sakai has undoubtedly the best Sankes and Kohakus in Japan – his show record speaks for itself. So to find high quality at his farm is not too difficult, but to find it at an affordable price-remember we are spending rands now – and be confident ZNA judges will look favourably at them is not easy! 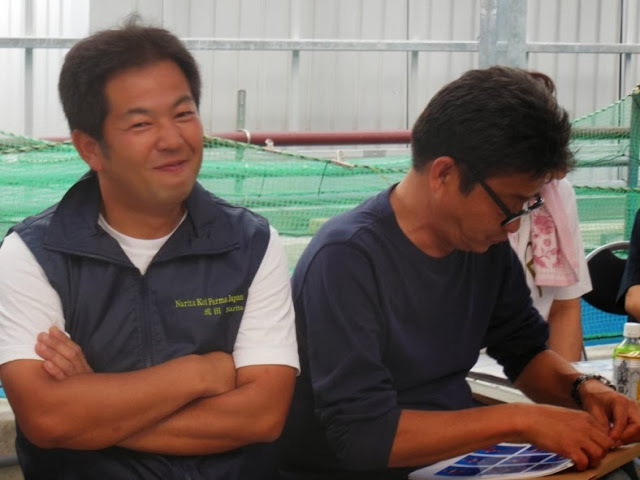 Kentaro Sakai has what many of us would consider a highly enviable job, however one has to think of the pressure he has on him to keep producing the quality gosanke his farm is famous for, and to ensure that they keep winning at the top shows in the world. For the prices he charges for his top end Koi, his customers have huge expectations! 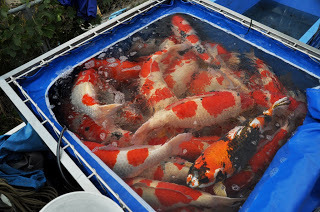 Remember, there can only be one All Japan Grand Champion each year and he has a number of loyal customers all looking for this Koi, who are prepared to spend excessive amounts of money to acquire it. Needless to say he has a stressful time juggling these customers. b) How much could he potentially get from another customer for the same Koi? d) Is the Koi going to stay at his farm and compete in Japan-more responsibility/risk and pressure for him than if it is going to be shipped? Based on these directives I assured Kentaro San that I had already done a lot of business with Sakai Fish Farm over the last 8 years making the long journey to Japan at least twice every year. My customer was very supportive. 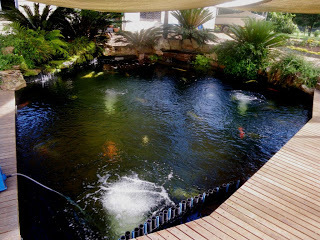 I was looking to keep the Koi at the farm for just one more year and while my customer would love to show the Koi in Japan, he was realistically more interested in showing in South Africa. Finally, if Sakai Koi do well in the South African shows then it means good advertising for Sakai and me for future business. Once we had had our preliminary conversation and we understood one another, he took me to his “first class” pond. 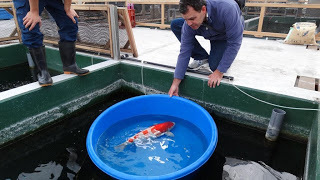 Mark had decided on going for nisai (2 year old Koi) because at this age the Koi are reasonably stable and one can judge quite accurately as to their future potential, but the cost is a lot less than an older Koi of the same quality. Here it gets very interesting because these selected Koi are all good, but they vary in price dramatically depending on certain small variables. For example, in Asia -where the vast majority of the high end dealers/customers come from – a lot of value is put on certain patterns. For example, they love maruten and “flowery”, unusual patterns. I focused on the Koi with less “complicated” patterns. I began with the sanke. 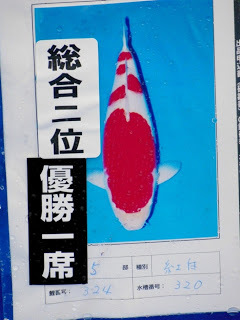 Being 3 colours it is a bit trickier to select than a Kohaku. In the Sanke I went for a Koi from a good parent and one with a strong body and skin and with pronounced sumi in the right areas. I was happy with a simple, but balanced and attractive pattern. I selected a Koi which stood out in the pond. I have to say that I chose this Koi as a “marker”, not expecting the price to be within budget. 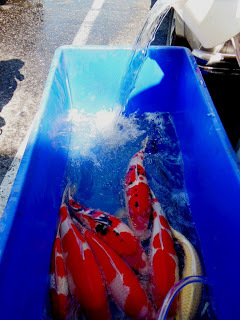 When Kentaro gave me the price I was very pleasantly surprised and immediately asked him to reserve the Koi – knowing full well that if Mark did not like the Koi/price I was more than prepared to take it as stock. We then went on to the Kohaku.The Kohaku ended up taking a lot more time. 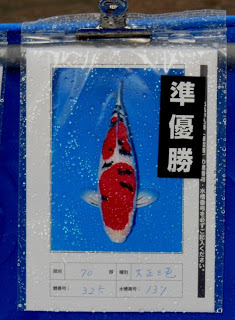 Kentaro first presented me with his choice of Koi within the price budget, but I was not happy with his selection. In Japan it is not polite to say no outright, so one must be “subtle” in declining an offer saying something like “Very nice Koi, but can we also look at another one?” After “declining” a few offers I decided to personally select a Koi. I chose a slightly smaller Koi, but one with an imposing body, great shiroji and soft beni. 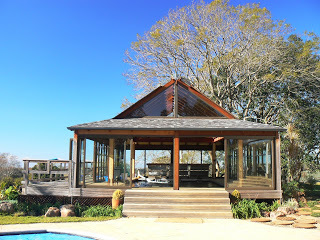 Once again the pattern was simple but well balanced, with the large front step adding to the strong looking body. The price was too high, but I then said I would consider taking both Koi at a slightly reduced price, after some deliberation and a lot of “pleading” he finally accepted. Fortunately Mark loved both Koi. 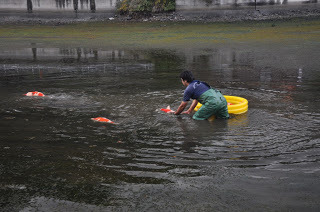 The Koi went into Sakai’s mud ponds for the summer and were harvested in Autumn-October. 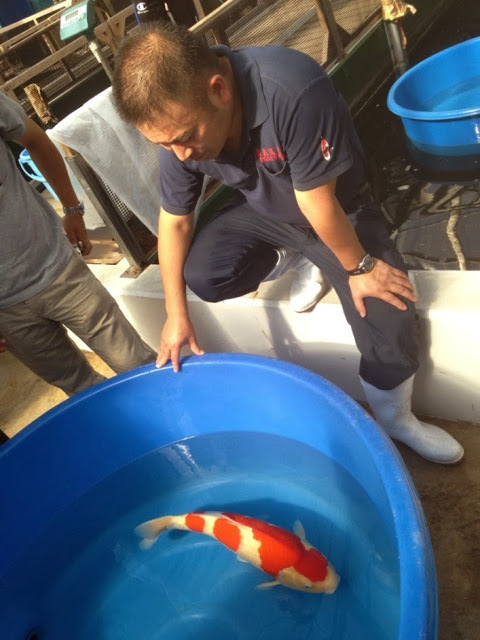 I received an e mail from Kentaro with pictures of the 2 Koi to say that they had both progressed really well and he wanted to offer Mark the opportunity to show the Koi in the “International ZNA Koi Show” in Kobe during November. Of course this was a very pleasant surprise and Mark understandably jumped at the opportunity. I made sure that my plans to visit Japan coincided with the show dates. When I arrived in Japan about 2 weeks before the Show I went straight to Sakai and asked to see the Koi. 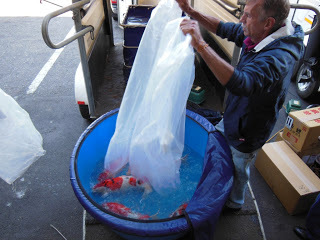 Both fish were being kept in Kentaro’s private fish house with the other Koi selected to go to the show. 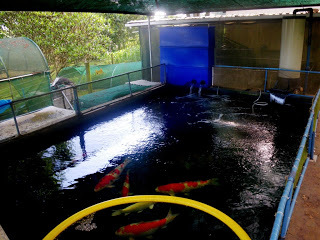 In this house the water quality is superb and the fish are “groomed” for the major shows. I was very keen to see the Koi, but did not want to disturb them too much, so I just viewed them in a floating bowl. I could see straight away that they had progressed remarkably well in size and quality- especially the Kohaku, although the bigger Sanke was still my personal favourite. I was really looking forward to the Show. On the day the weather was typically terrible with pouring rain. 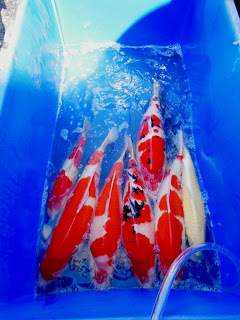 Sakai alone had entered 50 Koi, bought to the show in transport vats in 3 trucks. The quality of the Koi was excellent. I had no idea in which vats the Koi were, so I went through them all. It was interesting to be able to immediately notice the vats containing the Sakai Koi. 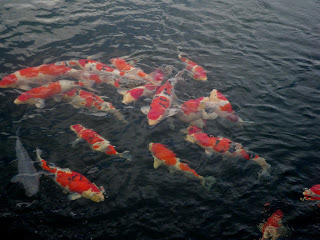 The average koi’s body shape and lustre was a level above the other Koi – we are talking gosanke of course! The first Koi I found was the Sanke. She had travelled well and was looking great, but unfortunately no prize! I felt a bit disappointed, but 70bu is an extremely competitive class and Sakai had bought a number of Sankes to the Show in this size group. My disappointment quickly subsided when I found the Kohaku- 1st in 65bu Kohakus and 2nd overall in her size group – an amazing result!! 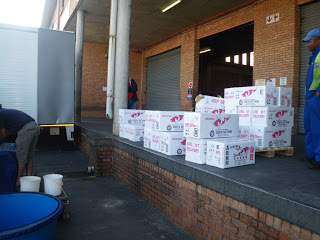 Collecting the koi shipment at OR Tambo. 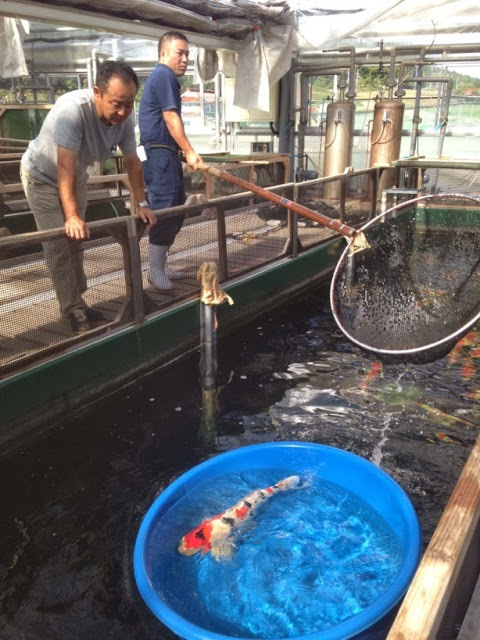 After that the pair had to go through quarantine at Dream Koi’s farm. “Betsy” rising above her Sakai pond companions.
. Fortunately the shipping and quarantining went smoothly and it was not too long and Olympia and Betsy were happily residing in Dream Koi’s 100ton indoor pond! Great to see South Africa represented in the winners list in the Nichirin magazine-well done Mark!! 2013 All Japan Grand Champion? With the biggest,most prestigious koi show in the world happening in Tokyo this weekend the question on every ones lips will be which breeder/koi will win the main award. I correctly predicted she would win. 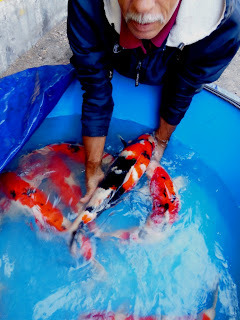 The general trend is that a koi wins the All Japan and then gets sold to a hobbyist to win a smaller show- often the All Asia Show- or gets used by the breeder as a parent koi. 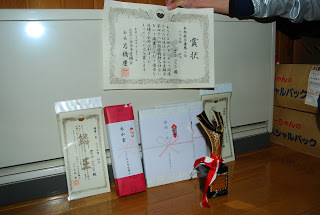 Generally this is because a fish really has to be at its peak to win this award and will generally never reach this level again – as the history of All Japan winners proves. 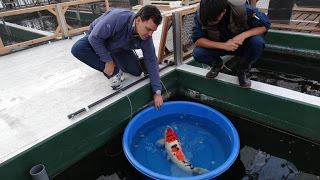 This koi was sent back to Sakai to be spawned as a parent.Kentaro spawned her successfully last year.The amazing thing is,after spawning she is now looking bigger and better than ever – in my opinion.Will the 9 year old “M Legend” be good enough to win for a second time-with a years gap in between? I reckon she will make history with “Loran” and win again this weekend! 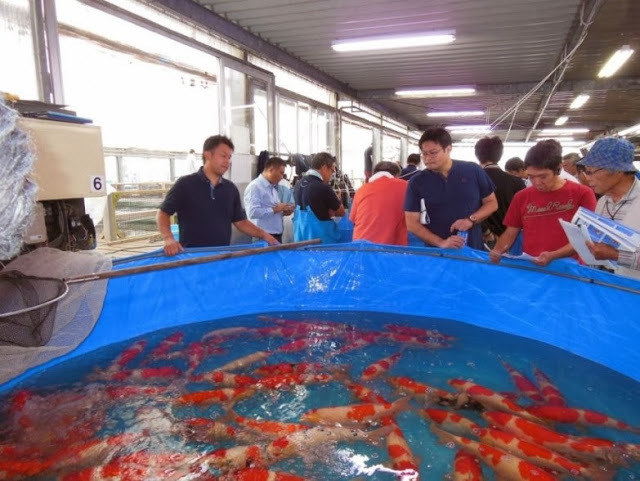 Manabu Ogata-owner of Ogata Koi Farm- worked for 6 years for Izamiya in Niigata before staring his own farm.Since then he has a very good relationship with Izamiya-even taking on Izamiya’s son for a few years as an apprentice. Everyone known that Izamiya producers the best Yamabuki Ogons in Japan.Every year Ogata buys a few thousand of his frys and grows them on to be sold. Three years ago I bought a good quality sansai Yamabuki from Ogata.When I bowled the koi yesterday she measured over 90cm and I was very impressed with the quality of her body and in particular her lustre. I have always had a soft spot for his ogons and this year I purchased a few of his better nisai to sell and also grow on. Another of his varieties I am fond of are his Chagois.I bought these 2 in March as tategoi nisai.Now both are sansai and 72cm and 74cm respectivley! 80cm as yonsai? Very possibly since I have now moved them to the new 90 ton pond. During his recent Auction in November I managed to buy his 2 best nisai for my customer-they are also in the 90 ton pond for a year of growth. We will see how these Chagoi progress over the next 12 months. 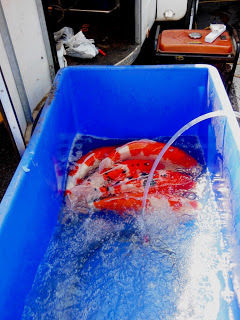 During my trip to Japan in November I blogged my visit to Beppu Fish Farm and,in particular,my experiencing their jumbo koi harvest. 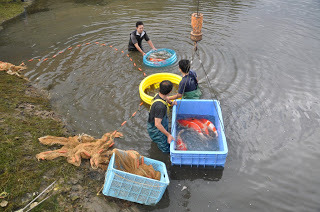 With time being so limited I never had time to upload the videos I took of the koi being harvested.Please have a look at these links and I hope they give you some idea of the quality/size of the koi.All the koi were yonsai or older and minimum 75cm. 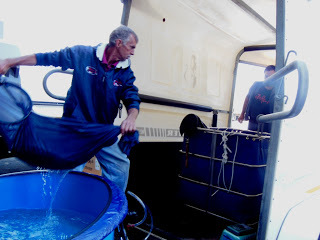 It’s amazing how many koi one can safely load into a transport vat and they can comfortably stay there for many hours-they pump pure oxygen through a regulator and gently out of a ceramic air stone. 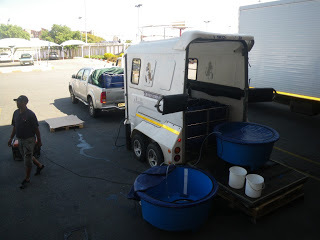 Waiting for the koi to clear in Johannesburg- 2 x 1 ton and 2 x 750kg vats with mature pond water brought up from Durban-never mix salt with fresh water!Carry extra water for mixing-the vats must go home completely full so that the water does not “wash” around in the vat. 35 boxes! First seperate the different breeders. 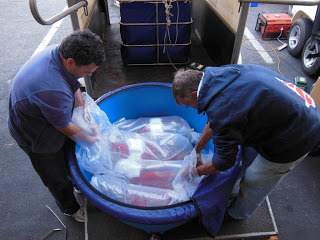 Momotaro koi very well packed and marked. 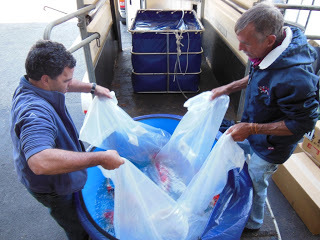 Open and check koi so that we can unpack any that may not look strong first.Start with the Sakai koi-most valuable and travelled the furthest. 4 bags at a time in a mixing bowl-enough water so that they can swim around. Open all the bags at the same time. Drain off excess travel water,check ph and slowly mix in water from the vat-keep strong oxygen going.Do preliminary check on the koi and photograph any with bumps/bruises to treat later on. 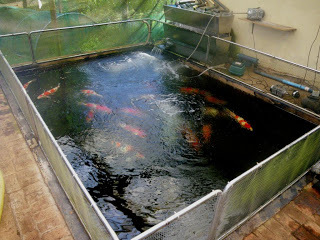 Once the ph has stabilised,move the koi to the transport vat-either by hand or a sock net so that “dirty” water does not transfer across. At the same time,start the Beppu koi-only 6 boxes so can do them all at the same time-separate mixing bowl/air ring,sock net,etc. Stabilise the ph with pond water. Give them some time to acclimatise. Carefully put in transport vat. 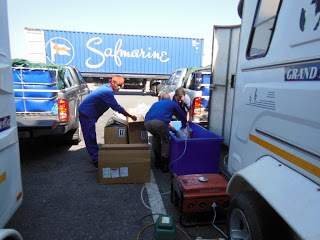 Once all the fish are safely loaded then we headed back to Durban using 12v Resun air pumps with a generator as a backup. Once back in Durban 2/3rds of the vat is drained,the ph checked and water from the pond the koi are being put in pumped into the vat.After the koi have acclimatised then the fish are moved from the vat to the pond-separate ponds for different breeders.Above is the pond being used for the Sakai koi-90 tons. Sakai koi happily settled in. Much simpler with only one breeder.